Zvi Ganin is one of Israel’s leading scholars of Zionist history. He served as Professor of Modern Jewish History at Beit Berl College, the largest state teachers college in Israel, from 1974 to 1998, twice serving as chairman of the department. His books include Truman, American Jewry and Israel, 1945-48 (Holmes & Meier, 1979); Kiryat Hayyim: Experiment in an Urban Utopia, 1933-83 (Milo, 1984); and, most recently, An Uneasy Relationship: American Jewish Leadership and Israel, 1948-1957 (Syracuse University Press, 2005). He also edited (with Y. Freundlich) the reference volume Political Documents of the Jewish Agency, May 1945-December 1946 (Hassifriya Haziyonit, 1996). Prof. Ganin is now working on a book about Abba Eban’s service as ambassador to the United States during the Cold War. the auspices of the B’nai B’rith Lecture Bureau and the Hillel Foundation. He has also served as Scholar in Residence at the University of Arizona, Tucson, and at Arizona State University, Phoenix. As a result of the petitions, the Holocaust Museum announced that it will, by next spring, add material to its Permanent Exhibit acknowledging the Bergson Group’s role in promoting rescue from the Holocaust. To commemorate Yom HaShoah (Holocaust Remembrance Day), in April, the Wyman Institute sponsored a special performance of Bernard Weinraub’s “The Accomplices, “ an off-Broadway play about the Bergson Group. At a reception after the show, speakers included Bergson’s daughter, Dr. Rebecca Kook; Jeremy Ben-Ami, Wyman Institute board member and son of a Bergson Group leader, Yitshaq Ben-Ami; and Mr. Weinraub. They were joined by members of the cast and crew for a lively and informative discussion. In July, the Young Israel of Long Beach (NY) held an event honoring a member of their community, Rabbi Samuel Turk, for his participation in the 1943 rabbis’ march in Washington. Wyman Institute director Dr. Rafael Medoff was the featured speaker. Rebbetzin Deborah Turk and their son, Rabbi Mishael Turk of Monsey, NY, also took part in the event. The New Press has issued a paperback edition of David Wyman’s classic, The Abandonment of the Jews, with a new introduction by Prof. Wyman and a foreword by Elie Wiesel. Copies may be ordered for $20 from The David S. Wyman Institute for Holocaust Studies, 1200 G St. NW, Suite 800, Washington, DC 20005. Prof. Rosenbaum will also speak (along with Ira Stoll of the New York Sun, Nathan Diament of the Union of Orthodox Jewish Congregations, and Ruth Messinger of the American Jewish World Service) on “Are Jews Becoming Closet Conservatives?,” at the 92nd Street Y, on December 3, 2007. Wyman Institute Advisory Committee member Dr. Ruth Gruber will speak, together with Harold Ickes, Jr., at the 92nd Street Y, on November 29, 2007. (Tickets: call 212-415-5729) Dr. Gruber’s latest book, Witness: One of the Great Correspondents of the Twentieth Century Tells Her Story, has just been published by Schocken, 2007. It includes photographs of the Holocaust refugees at the shelter in upstate Oswego, New York, which she helped organize, at the direction of Mr. Ickes’s father, Interior Secretary Harold Ickes, Sr. Academic Council member Prof. Gershon Greenberg (American U.) was one of a small group of scholars selected to participate in a summer research workshop at the U.S. Holocause Memorial Museum on the responses of American Catholics, Protestants, and Jews to Kristallnacht. He and his colleagues presented their research findings at a Museum event on August 24. Arts & Letters Council member Stuart Erdheim spoke about American Jewry’s response to the Holocaust at Congregation Rodeph Sholom, in New York City, on April 17. Wyman board of directors member Robert Weintraub organized and introduced the event. Wyman Institute director Dr. Rafael Medoff spoke on “The Haggadah That Challenged Hitler: Arthur Szyk, Artist and Activist,” at the Synagogue for the Arts, in New York City, in April. Special thanks to Rabbi Jonathan Glass for organizing the event. Debbie Benami-Rahm, daughter of Yitshaq Ben-Ami of the Bergson Group and leading member of the Wyman Institute’s “They Spoke Out” network, will speak on the Bergson Group and America’s response to the Holocaust, at a Greater Miami Jewish Federation event on January 9, 2008. The Hon. Franz Leichter, member of the Wyman Institute’s board of directors, traveled to Austria in May to visit the site of the Ravensbruck Concentration Camp, where his mother, Marianne Kathe Leichter, was murdered in March 1942. Senator Leichter was accompanied by his children, one of whom, Kathy Leichter, is a filmmaker who is working on a documentary about her grandmother’s experiences. While at the camp, they joined with Austrian survivors who were present for the annual commemoration of the camp’s liberation, and together held a ceremony to honor Marianne Leichter. A prominent actress from Vienna read some of Mrs. Leichter’s writings and a poem she composed in the Camp which survived through inmates memorizing it. “Dictation: A Quartet,” a collection of four novellas by Cynthia Ozick, chair of our Arts & Letters Council, will be published in April by Houghton Mifflin. Prof. Haim Genizi (Bar Ilan U. ), a member of our Academic Council, authored a review of Buried by the Times: the Holocaust and America’s Most Important Newspaper, by Laurel Leff, for the September 2007 issue of the Journal of American History. A new one-hour documentary film, House of Life: The Old Jewish Cemetery in Prague, narrated by Claire Bloom, is a collaboration of Academy Award winning filmmaker Allan Miller (From Mao to Mozart) and artist (and Wyman Institute Arts & Letters Council member) Mark Podwal. From the film’s description: “Prague’s Old Jewish Cemetery, a place of haunting beauty and mystery, has endured wars and pogroms, floods and fires, assimilation and an urban clearing project that destroyed most of the ancient Jewish Quarter it once served. Miraculously, it even survived the Nazi occupation. The cemetery’s heart-rending chaotic landscape reflects the cramped conditions of the former ghetto. In the film we encounter the curators, historians, rabbis, guides, conservationists, all devoted to the preservation of this unforgettable place.” House of Life will premiere in Prague on September 17, 2007 at The National Film Archives and in the United States this October at The Hampton’s International Film Festival . Academic Council member Prof. Alan Berger (Florida Atlantic U.) was guest editor of the April 2007 issue of the journal Literature and Belief, a special issue on Elie Wiesel; he also interviewed Wiesel for the issue. Prof. Berger’s essay, “Faith and God During the Holocaust: Teaching ‘Night’ With The Later Memoirs,” appeared in Approaches to Teaching ‘Night,’ published in 2007 by the Modern Language. Academic Council members Prof. Rochelle Millen (Wittenberg U.) and Dr. Myra Goldenberg co-edited the book, Testimony, Tensions and Tikkun: Teaching the Holocaust in Colleges and Universities, published by the University Of Washington Press in May/June 2007. The volume, which is part of the Goldner Series on the Holocaust, included chapters by each of them, as well as by Prof. Mary Todd, who is also a Wyman Institute Academic Council member. The Wyman Institute offers its deepest condolences to the family of Dr. Burton Appleton, a longtime Institute supporter, who recently passed away. May his memory be for a blessing. September 6, 2007: Prof. Thane Rosenbaum will moderate a panel on “Modern Anti-Semitism: A Conversation with Abraham Foxman and Stuart Eizenstat,” at the 92nd Street Y, at 8:15 pm. Call 212-415-5729. November 29, 2007: Dr. Ruth Gruber and Harold Ickes, Jr. will speak on the shelter in Oswego, NY for Holocaust refugees, at the 92nd Street Y, at 8:15 pm. Call 212-415-5729. December 3, 2007: Prof. Thane Rosenbaum will speak (along with Ira Stoll of the New York Sun, Nathan Diament of the Union of Orthodox Jewish Congregations, and Ruth Messinger of the American Jewish World Service) on “Are Jews Becoming Closet Conservatives?,” at the 92nd Street Y, at 8:15 pm. Call 212-415-5729. January 9, 2008: Debbie Benami-Rahm will speak on the Bergson Group and America’s response to the Holocaust, at a Greater Miami Jewish Federation. 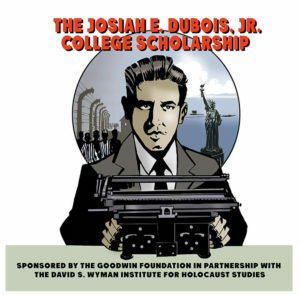 March 30, 2008: The Wyman Institute will sponsor a session on “New Research on America’s Response to Nazism and the Holocaust,” at the annual conference of the Organization of American Historians, in New York City. The session will be held at the Center for Jewish History, 15 West 16 St. on Sunday, March 30, 2008; time to be announced. Speakers will include Prof. Stephen Norwood (U. of Oklahoma , member of our Academic Council) on “American Universities’ Response to Nazism, 1933-1939”; Prof. Laurel Leff (Northeastern U., and a member of our Academic Council) on “How Media Coverage Has Shaped American Public Perceptions of Genocide”; Dr. Susan Subak (Washington, D.C.) on “American Unitarian Efforts to Rescue Jews from the Holocaust”; and Dr. Melissa Jane Taylor (State Department Office of the Historian) on “American Diplomatic Responses to the Anschluss.” Dr. Rafael Medoff will chair the session. The event will be open to the public. For more information, call the Wyman Institute at 202-434-8994.